Location: Eastern WA about 25 miles north of Dry Falls. Extras: The above price provides the angler with access and fishing on these private eastern WA lakes. 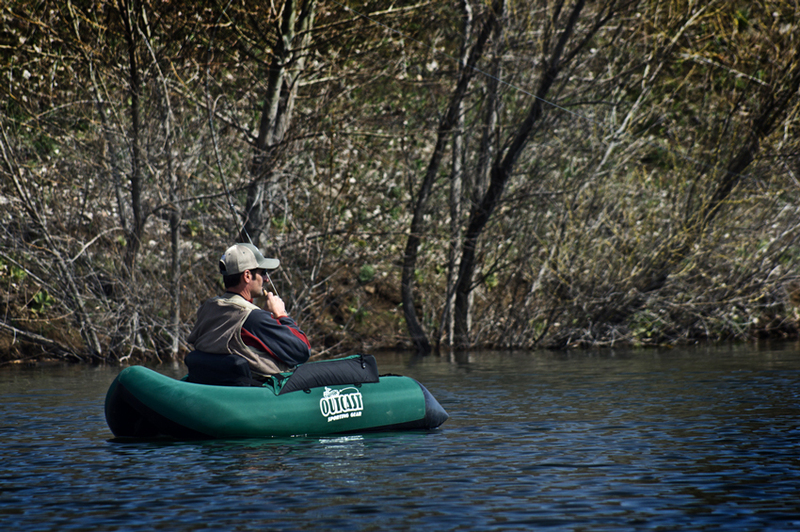 Fishing equipment, boats, food, drinks, transportation and tips are the responsibility of each angler. 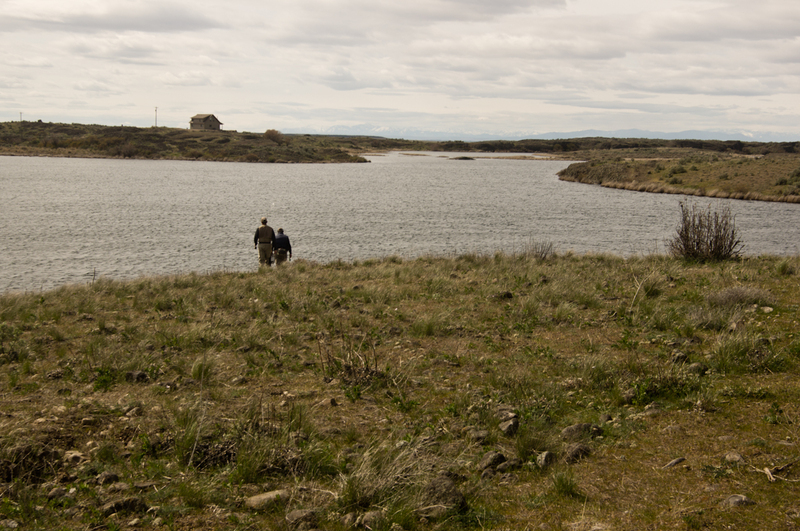 Isaak's Ranch has two lakes for fishing. The upper lake is approximately 30 acres and is managed for numbers of fish. The rainbows in this lake average 16" to 20" with larger fish possible. General lake techniques are effective and at times the fish are on the surface along the shorelines and in the bays and coves. The lower lake, which is approximately 35 acres, is managed for fish size. The average fish in this lake runs 5-8 pounds with many in the 10 to 12 pound class. These fish are very strong and acrobatic and 1x tippet is as light as an angler should fish. This lake has a very interesting shoreline and includes many shallows. The lower lake also has a few brown and tiger trout, a few of which are caught every year. Andrew Grillos with one of the lower lake giants. April 12th - We had a great trip out to Isaak's Ranch last weekend. The day was sunny with a light wind and 70 degrees of springtime heat, and some of us came away with a solid sunburn. We were one of the first groups on the lake, and by all accounts, Isaak’s has a lot of good days in store for those who make the trip this season. Darc put us all on the upper lake, as the lower lake was still cloudy and not productive. Action was slow till around 11 AM when the water temperature started to rise and insects started moving. The early technique of choice involved stripping olive, maroon, or black beaded wooly buggers on an intermediate sinking line at a medium pace. The fish that were moving in the early hours took like a freight train, slamming the fly, hooking up and, in some luck cases, leaping several times. Around noon, charcoal covered midges started popping and indicators started going under. Jim Beams in 8, bloodworm patterns in 12 and Ice Cream Cones in a motor oil color in 12’s and 14’s were extremely productive. White bunny leeches trolled in shallow water also resulted in a large share of hook-ups. The fishing remained hot until around 3 PM as the insect activity tapered down, then occasional fish were taken; but by and large the hottest action was had in the middle of the day. Other patterns of note include water boatmen – don’t head out there without ‘em. All anglers had success, and the largest fish hooked was upwards of 25" and extremely fat. Of the four anglers with varying experience, the lowest numbers were around six and the highest around fifteen, possibly more. Isaak's lived up to its reputation yet again, doling out pulls and piggly rainbows with reckless abandon. The company couldn’t be beat. October 7th - We had a great trip out to Izaak's Ranch last weekend. The day started out a clear – a great respite from dreary Seattle weather. Despite a fair amount of aquatic plant growth and a constant, manageable wind, the fish were waiting for us when we got on the water. Darc put us all on the upper lake, which was a little low for the season, but yielded high numbers of fat, healthy rainbows. The technique of choice involved stripping olive, maroon, or orange beaded wooly buggers on an intermediate sinking line at a medium pace. Fish would take lightly, sometimes hitting the fly two or three times before hooking up. A trailing bead-headed nymph – Squirrel Tail in 10 or a Lightning Bug in a 12, also produced fish. All anglers had success, and the largest fish hooked was upwards of 25" and extremely fat. Of the four of us anglers with varying experience, the lowest numbers were around three and the highest upwards of twenty. 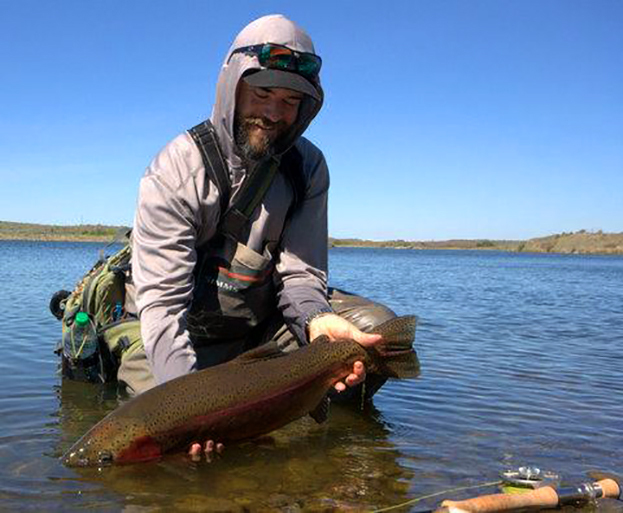 That's to say that beginning anglers can easily hook into beastly rainbows without undue effort, and experienced anglers can catch fish all day long. All in all, Issak's lived up to its reputation as an exceptional lake fishery. April 14 - The group convened 8:00 PM Friday night at Ala Cozy Motel in Coulee City in anticipation of big fish on big flies in either the upper or lower lake. Through much bantering and some hearty beverages, spirits were high for the next morning. We rendezvoused with Darc, Isaak’s manager, early on Saturday morning and got rigged up. The weapon of choice was a three-toned leech fished aggressively, although a couple anglers chose an Ice Cream Cone chironomid fished five to ten feet below an indicator. By the time lunch rolled around, all six of our guests had hit fish, the biggest of which was approximately twenty-six inches, taken on a leech. Even the fourteen inchers were strong enough to be played on the reel! Feeling confident, we retired for lunch and feasted on chips, sandwiches and beverages. The settings and surroundings were peaceful, though the wind picked up a bit to make casting an effort for the rest of the day. Luckily, it didn’t matter. Although we had all taken small to medium-sized rainbows to hand before lunch, the morning fishing paled in comparison to the afternoon activity. Between the five anglers, we hit thirty fish on leeches and chironomids for the remainder of the day. We had to switch hands to play fish because my arms were so sore, and we weren’t alone. One of our anglers, John "Rockstar" Lake, reported hitting fish "cast after cast", despite some technical difficulties involving a water bottle. It was stupid fishing! The group fished till six o’clock, and then it was time to pack it home. There were sore arms and big smiles all around. For the easily accessible location, and the time it took to get there, Isaak’s certainly didn’t disappoint. Written by Joel Oerter who interviewed trip host, Brita Fordice. May 6th - The group convened 7:00 A.M. Sunday Morning at the Dry Falls Cafe in Coulee City. Coffee and waffles were a solid bet for a good breakfast, and the sunshine streaming through the windows promised an equally good day on the water. We met Darc at the cafe, Owner and Operator the The Desert Angler in Ephrata, WA, and Isaak’s manager, and caravanned to the lakes. The group had the opportunity to fish on the lower lake all day long, and as we rigged up, Darc set us all up with the chironomid of choice – a size 8 Jim Beam. Apparently, these fish were not selecting flies for size. When we asked what type of rig we should fish, we were given the surprising response of “a 9 foot leader tapered to 2x” with a no-nonsense delivery. Unbelievable! As we were getting into our boats, we watched as Darc demonstrated just how “no-nonsense” this technique was - he brought a fat 18” rainbow to hand within 5 ft of the boat launch. 2x indeed! Fired up from the manager’s demonstration, we all hit the water with chironomids. Two of us started to the far side of the lake, and the other two stayed close, fishing along the bullrushes. Fish were cruising and active in the morning clarity, and each of us started to immediately hook into lunker rainbows. The feeling of “I should have brought a bigger net” was expressed in hoots and hollers as we moved west along the lake. The fishing was fast and furious for the first hour and a half (roughly 9:30 AM – 11:00 AM), and then it began to taper off. Two of us switched to an olive wooley bugger on a type II sink, and moved out into some deeper water away from the edges. This proved to be productive fishing all the way until lunch at 2:30, when we met back at the launch for grilled chicken and steak. We had all landed good numbers of fish, with the low being 6 and the high being 14, and the largest to hand at an estimated 24” (it was off the scale on the boat apron, anyhow). The afternoon fishing was a little less intense than the morning, and the group mostly fished the far end of the lower lake in increasing wind. The structure didn’t seem to matter, however, and thin mints, olive beaded wooley buggers, carey’s specials, and custom ties all took fish as well as the chironomids Darc had recommended. As the group took off around 5:30ish, we had all doubled our numbers, and I stayed to fish the twilight. There were callibaetis coming off after 6PM, and fish were rising in the still waters away from the wind. The ideal pattern was a callibaetis cripple, one that I didn’t have, so I tied on a parachute Adams in a 14 to no avail. File that one away in the “Flies I Should Have Brought” column. Overall, the most productive method of fishing the lake was with a leech or a bugger fished deep, but we all hit fish on chironomids until our arms were tired. Set in an ideal place, Isaak’s ranch is quite an amazing lake fishery, and we had a day with minimal wind and sun in the morning. Awesome!